Description: The plaice is one of the commonest flatfish encountered by divers, snorkellers or people paddling on sandy beaches. It is diamond-shaped in outline and both eyes are on the right hand side of the body. The upper surface is pale greyish-brown in colour with conspicuous bright orange spots and the underside is white. It can change colour to match that of the surrounding seabed but the orange spots are always distinct. Adult fish are usually between 50-60cm in length. 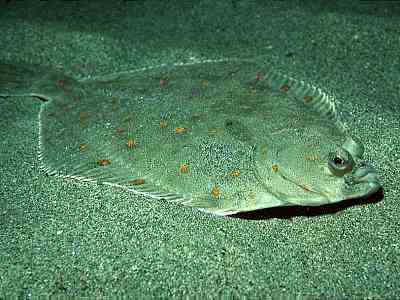 Habitat: Plaice are usually found on sediment type seabeds e.g. on sand, gravel or mud at depths between 10-50m. They are mostly nocturnal and during the daytime they are normally found lying on the seabed, partially covered by sediment. They feed on bottom-living animals, particularly bivalve molluscs. Juvenile fish spend most of their first year in very shallow water and are often encountered by people paddling or snorkelling over sand, close to the water's edge. Distribution: Common all around the coasts of Britain and Ireland. Similar Species: The plaice could be confused with other flatfish species e.g. the flounder and dab but can be distinguished by the bright orange spots on the upper surface. Picton, B.E. & Morrow, C.C. (2016). Pleuronectes platessa (Linnaeus, 1758). [In] Encyclopedia of Marine Life of Britain and Ireland.